Facebook is making its Timehop-style feature, On This Day, bigger and better. This means that Facebook will show you more memories than ever, filter out bad memories likely to upset or annoy, and show you friendship milestones. All of which will be great for fans of nostalgia Dig Up Old Social Posts with These 5 Tools Dig Up Old Social Posts with These 5 Tools Here are five tools that make it easier to find old Twitter and Reddit posts. Browse your own personal past every day. Read More . On This Day is a nice feature that adds a touch of nostalgia to Facebook. On This Day basically reminds you what you were doing one, two, or even 10 years ago, based on what you posted on Facebook. And now Facebook is expanding its reach, and improving how the feature works. First, Facebook wants to show you even more memories. So, now, it won’t just be individual memories from specific days, but rather whole collections of memories from particular months of seasons. The two examples Facebook cites are “Your January Memories” and “A Look Back At Your Summer”. Both of which offer photos and updates posted within that timeframe. Secondly, Facebook wants to celebrate your friendship milestones. This involves you getting a pat on the back when you make a notable number of friends or have your posts liked a certain number of times. At the moment these will only be visible to you, but they will become shareable in the future. Which means Facebook is about to get gamified Why Gamification Is Not The Magic Bullet Everyone Thinks It Is Why Gamification Is Not The Magic Bullet Everyone Thinks It Is Gamification is spreading across the web like a plague, as if slapping on a few badges and leaderboards is enough engage users. The truth? Gamification can harmful. Read More . Finally, Facebook wants to help you filter out bad memories. On This Day already boasts some controls and preferences to ensure you’re happy with the memories being surfaced. However, Facebook claims it has developed new ways to filter out memories that may spark negative feelings. Which include failed relationships or people who have passed away. I must admit I enjoy having Facebook remind me of what I was doing on this day years ago. Memories good and bad can come flooding back. And these changes, which add more memories while helping you filter out those likely to upset you, should ramp the nostalgia up to 11 5 of the Most Powerful Nostalgia Sites on the Web 5 of the Most Powerful Nostalgia Sites on the Web Nostalgia is something the Internet loves. Let's explore a few places where you can feel connected to different parts of your past. There's something for everyone. Read More . Do you like the On This Day feature? How often do you share old memories with friends? Have you ever been shown a bad memory? How did it make you feel? 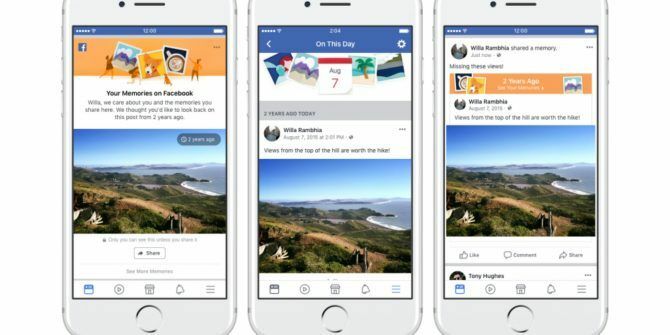 Are you pleased that Facebook is expanding the On This Day feature? Please let us know in the comments below! Explore more about: Facebook, Nostalgia. I think filtering out what Facebook considers "bad memories", especially of a loved one who's passed away is not something I'd appreciate. Memories of my son and my husband are all I have left of them. I would love to be sure to see those memories. I hate what you did to memories, it was fine on birthdays them I could share if I wanted and the rest nobody else could see. Now almost everyday Facebook, without my permission is dredging up all posts of mine and sharing them some from other private groups and other people can look at them constantly, its sickening. I'm just about done with Facebook, its like a game now. I have to stop sharing just looking at posts, its very scarey. I think This will be the end for me with Facebook I dont like this idea and am very surprised Facebook would do this. I have no control, but I am utterly disgusted and fed up seeing all my old old posts come up constantly, maybe I dont want them from years back, and times have changed, you should think about peoples feelings. You people better have a better idea if you are writers than stealing other peoples ideas! I DO enjoy ALL my daily On This Day memories. Today, May 21, when I opened it, nothing is showing although it says I have 100+ memories for this day from 2012-2017. Why can't I see any of them? I would enjoy seeing my memories going all the way back to my first post. Please fix whatever the problem is ASAP & I hope I'll be able to see whatever memories for today as well as each day in the future & past. I like ALL the memories in my On This Day. I don't know why but today none is showing even though it says I have 100+ memories from 2012-2017 today. Why is it not opening & how can I get it to open? Please fix it ASAP & let me see my memories for On This Day May 21 and all future & past days. I like what is done now and think the new ideas sound quite bad. How can I see the memories? I love it! Keep up the good work FACEBOOK!!! I want to be able to search different dates. I tried to share a memory which failed & I finally found it 20 minutes before midnight. I can't even get the memory feature to work on my FB account. Facebook says this feature is not available to all users yet. Show me all of my memories, what gives you the right to pick and choose between what's good and what's bad!!! Maybe I want to see the bad because it shows me how far I've come!! !